Boomba Torque Dampers are designed to eliminate wheel hop and improve the vehicle stability. They allow the wheels to gain better tractions and improve acceleration. They eliminate 100% of wheel hop. Installation is simple and does not require engine support. They are machined of lightweight, aircraft quality aluminum with solid polyurethane bushings. The polyurethane hardness is carefully chosen so the engine mounts do not transfer any excessive vibrations to the body but give you very solid feeling during acceleration. Motor mounts are direct replacement of the factory top dog bone mount, bottom dog bone mount and front mount. They use the same hardware. 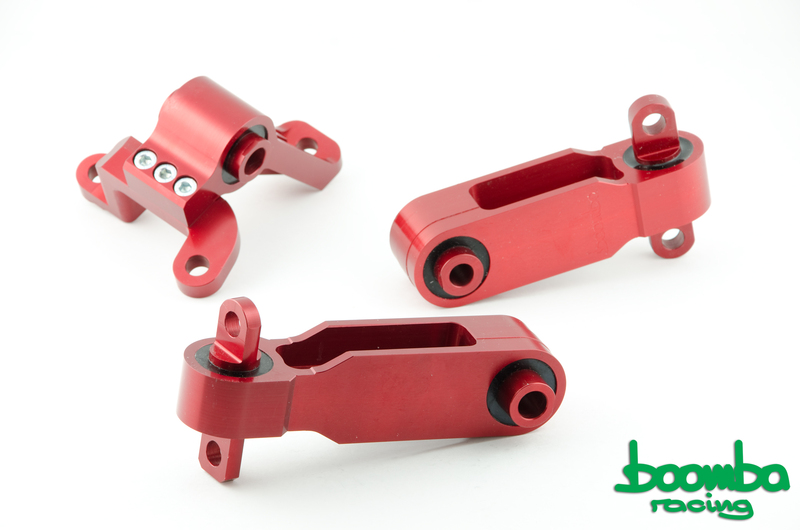 You’ll be surprised how smooth your car accelerates with Boomba Motor Mounts. Mounts are available with natural aluminum, red and black anodized finishes. Bump!! Let's get these SOLD! Honda Civic Type R (FN2) Motor Mounts If you want them PM for discount code! Fn2 mounts are now 50% off! 50% off! Get them before we are SOLD OUT! anyone actually got these on there fn2?